Put bird food out in a safe place, and you will discover one of the best ways of studying birds close up. You can make your own bird cake , such as the one here, and put out kitchen scraps such as stale breadcrumbs, chesse, fruit, cookked pasta, uncooked pastry , and bacon rind. Birds will really appreciate these tidbits, particularly in cold weather , when the ground is hard to peck at for worms and trees are bare of fruit and berries. Count how mant=y different kinds of birds visit. Also , notice which species (kind) prefer each kind of food. Note down the date, time and weather when you first see a new species. Do the birds feed quietly together, or do they fight over the scraps? Vegetable shortening , spoon, bowl, string, scissors, plastic cup. 1.	soften the vegetable shortening on a radiator or get an adlut to help you melt it in a pan. 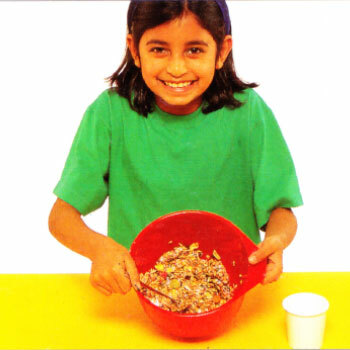 Mix the nuts, oatmealand crumbs in a bowl. Add the shortening and mix together. 2. 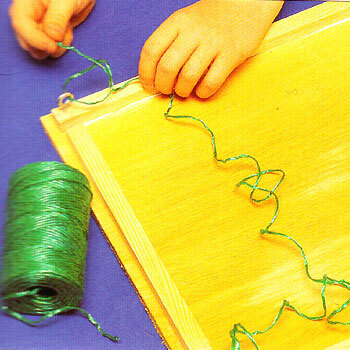 Cut a long piece of string. Tie a really big knot in one end. 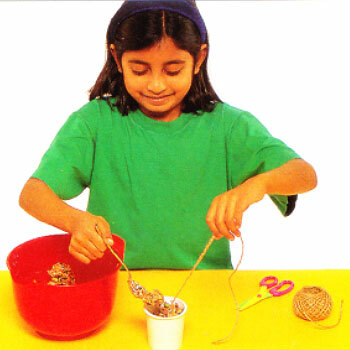 Pt the string into the cup , so that the knotted end is at the bottom, and spoon the mixtrure in the cup. 3. Ensure that the end of the string comes out through the middle of the mixtrue. When the mixture is set, pull the string to remove the cake. Hang it on a tree branch or window sill. 8X12in plywood board, two strips of wood 10in long and two 6in long, glue, hammer, nailsor panel pins, brush, varnish, four eye-hooks, strings, scissors. 1. 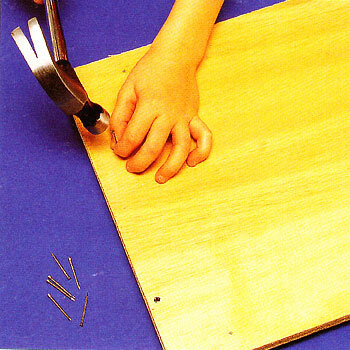 Lay the wooden string along the edges of your plywood board, as shown. 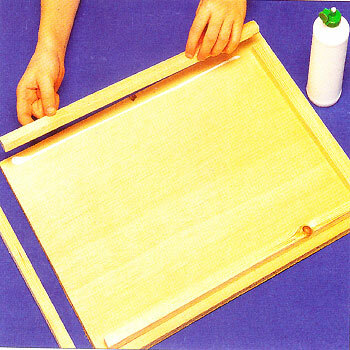 Now glue the strips of wood into position, so that the ends fit neatly together. 2. When the glue is dry, turn the board over. Carefully hammer nails through it, into the strips. If you find using a hammer difficult , You could ask an adult to help you to do this. 3. 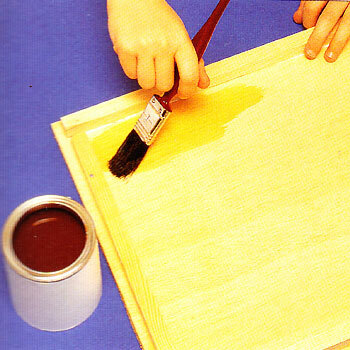 Paint the top surface of your bird table with a coat of varnish, to make it waterproof. When this coat is dry, turn the table over, and coat the underside too. 4. Screw eye-hooks into the strips at the four corners of the table. Now cut two pieces of string about 12in long. Tie the ends of the strings to the hooks. 5. Your bird table is now ready to be positioned. 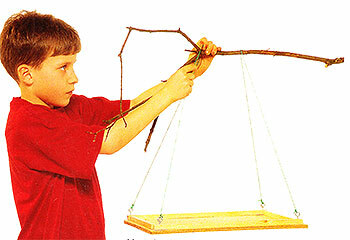 Hang it from a tree by easing the srings over a strong branch. 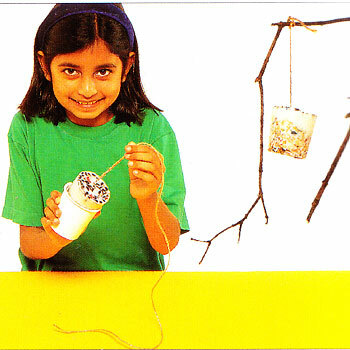 Adjust the strings, until the table hangs down evenly.